Our highly trained, committed staff. What we do on our courses to ensure long term, meaningful impact. The inspiring locations where our courses run. We run courses all over Oman, from the monsoon kissed mountains of Dhofar to Musandam, and from Masirah Island to the magical Empty Quarter. In the winter months, we focus on the desert, whilst in the hot summer months we retreat to the cool heights of Jebel Akdhar. The first of three purpose built centres for outdoor learning opened in October 2017, in the Sharqiya Sands of Oman. In January 2019, our Muscat training centre will open, followed by our mountain centre, located at nearly 8,000 feet above sea level on Jebel Akdhar. In addition to acting as centres for Outward Bound Oman, both the desert and mountain centres will act as field centres for educational geographical, biological and environmental research. Two indoor training/classrooms, AV centre, Kitchen, Dining Room, Equipment Stores, Accommodation for 60 on simple alpine sleeping platforms. Solar powered. 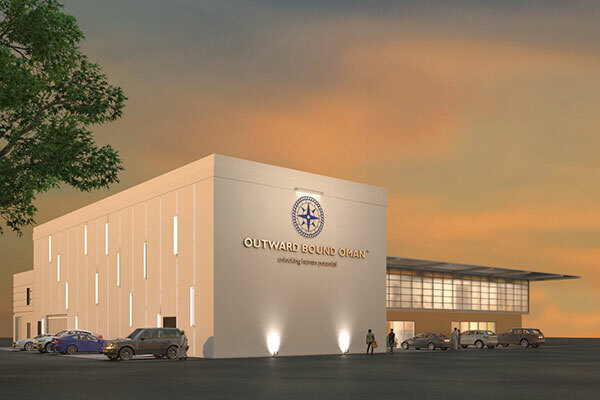 A central administration and equipment storage HQ for Outward Bound Oman operations. Two indoor training rooms for use by corporate and school groups, indoor climbing wall and tower for team challenges, AV centre for monthly community adventure lectures. Two indoor training/classrooms, AV centre, Kitchen, Dining Room, Equipment Stores, Accommodation for 60 in simple alpine sleeping platforms. Solar powered.